This model is a structured, user friendly and re-usable framework to facilitate easy comparison of different interpolation methods as well as provide a quick exploratory analysis tool. After running the model, the user is presented with a number of different views of the dataset allowing for quick grasp of the nature of modeled phenomena. The model uses a point shapefile with point attributes (e.g. elevation, temperature, etc.) as an input. 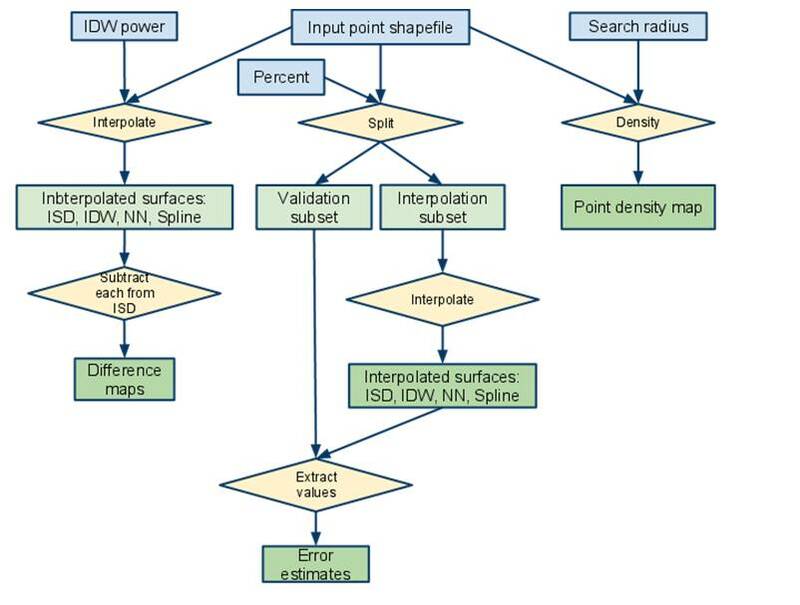 The user can further divide the input data into a training dataset for interpolating surfaces and a validation dataset for error estimation. Once the parameters are set, the model generates series of interpolated surfaces, difference maps, a point density map and error tables. The model features context help that guides the user through the process of entering input parameters. Attached is the ArcToolbox that contains the model. Save it somewhere on the disk. In ArcMap you have to open ArcToolbox, right-click in it and select "Add toolbox". Navigate to the file from the attachment and it should appear as a new Toolbox. Double-click it and the model's dialog box will appear. Click 'Help' on the bottem to enable context-sensitive pointers guiding you through setting parameters. After the model has completed running, you might need to set visualisation (symbology) options for your datasets. Error tables are automatically added to your current project (look under 'Source' tab in ArcGIS Table of Contents). jpg Diagram.jpg manage 39 K 05 Feb 2011 - 21:56 UnknownUser Flowchart showing the process the Model follows. pdf Paper.pdf manage 51 K 05 Feb 2011 - 21:50 UnknownUser Paper descibing in more detail workings of the Model and example project carried out utilizing the Model. pdf Poster.pdf manage 961 K 05 Feb 2011 - 21:49 UnknownUser Poster with quick overview of the Model's process and example outputs.